All Pink Floyd items listed below are authentic and very limited. We do not carry multiple items. All prices and availability are subject to change. All prices include shipping and handling for all USA customers. All other destinations will require actual shipping cost to complete transaction. Have a question? Ask us before purchasing the item. Thank You. Description: Pink Floyd - 1987 After Show Backstage Pass. Intact, never used. 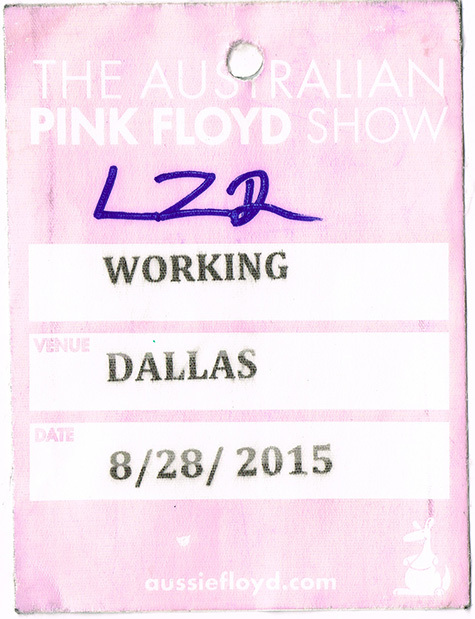 Description: Pink Floyd - 2015 Australian Tribute Working Backstage Pass. Intact, used. Note: This item VG condition. Description: 1974 Pink Floyd Dark Side Of The Moon Japanese LP booklet. Only available in Japan. 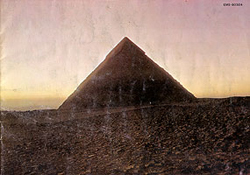 Photos and lyrics. Note: This item VG+ condition. 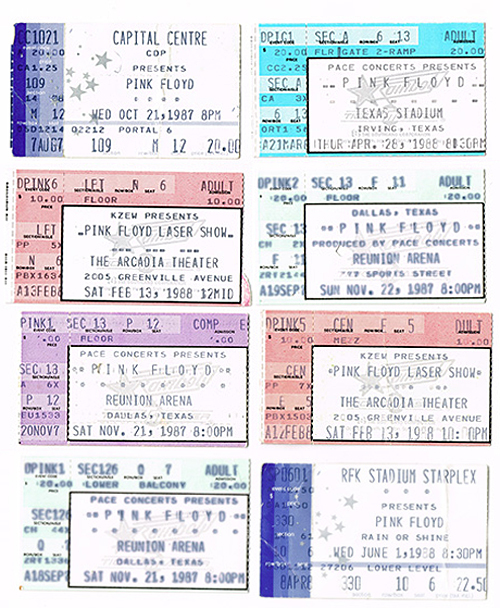 Description: Authentic Rainbow TicketMaster used bank check paid for Pink Floyd Concert Ticket purchase. Description: Pink Floyd Dark Side Of The Moon LP Stickers. Two 4x5 Color. Description: Pink Floyd Z107 Rock Radio Promo Stickers. 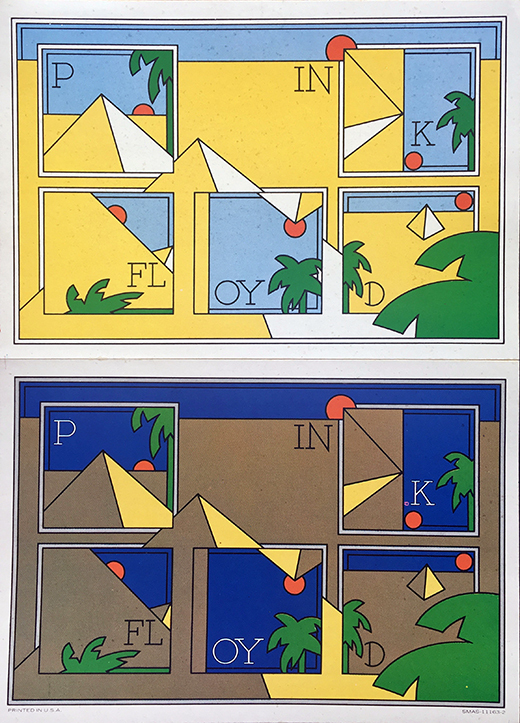 Two 3x9 Color. Description: 18 Original Pink Floyd photos taken on their 1977 Animals Tour at the Tarrant County Convention Center in Ft. Worth, Texas. Complete 4x6 photo set $34.99 Total Cost. Shipping Included. 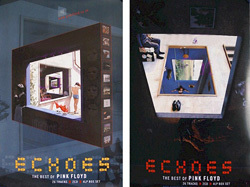 Description: Pink Floyd Echoes Promo Poster. Double sided. Size 24x34. Item in VG+ condition. Description: Pink Floyd Animals 1977 US Tour. Unused Ticket in mint condition. 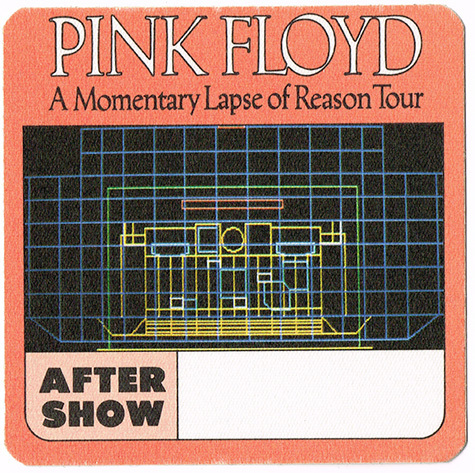 Description: Pink Floyd Momentary Lapse Of Reason 1987 US Tour. Unused Ticket in mint condition. 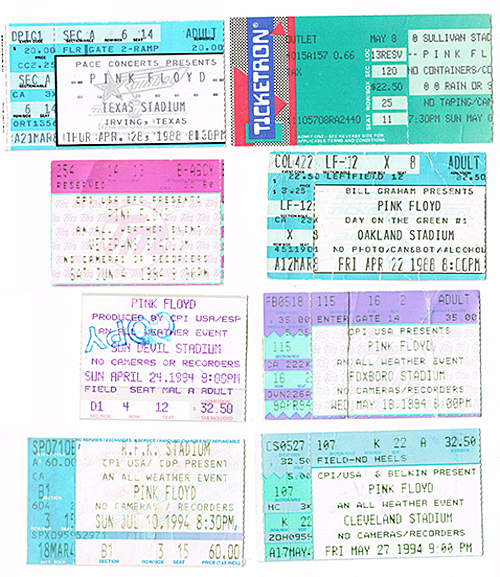 Other Pink Floyd Stubs In Stock. Click To View Large Image.